Has any single figure influenced so many poets and rappers as Malcolm X? This past week, I was covering Malcolm with the Fellows in the African American Literatures and Cultures Institute in Texas. What a good time we had reading, listening, and discussing. We primarily tried to concentrate on Malcolm on his own terms, but later, I began giving more thought to his influence and broad appeal among a range of literary and verbal artists. Malcolm's uses of vivid language, varied allusions, and powerful metaphors give his speeches a lyricism that would certainly impress several poets. And his dynamic application of wordplay, repetition, and rebellious rhetoric would appeal to large numbers of rappers. Malcolm's tendency to speak directly to black audiences has also always been a useful and usable model for poets and rappers. Shortly after Malcolm was murdered in 1965, activist-minded literary artists began memorializing the slain leader in their works. Black poets were especially adamant about the need to celebrate Malcolm's life and vision, while condemning the circumstances of his death and the ideas and approaches that he opposed. Malcolm's death in February 1965 and the birth of the Black Arts Repertory Theater/School less than two months later highlighted the connection between Malcolm X and the then emerging Black Arts Movement. Over the next decade or so, African American poets were the leading forces in the literary remembrances of Malcolm. In fact, I get the sense that they performed a crucial service in preserving and enlarging Malcolm's presence in the cultural imaginations of black communities. They had help of course. All kinds of folks passed along recordings of Malcolm's speeches, tattered copies of the autobiography, and materials featuring Malcolm's images. Yet, poets were vital in keeping the memory of Malcolm alive and well and prominent within literary history. 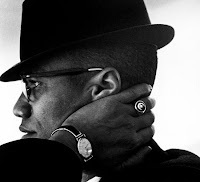 During the late 1970s and through the 1980s as several rappers were working to adopt or adjust militant and conscious personas, they often turned to the words and idea of Malcolm. Chuck D. Rakim. KRS-ONE. Nas. So many more. Even rappers not usually identified as politically conscious often follow in the spirit of Malcolm in terms of offering their "messages to the grassroots" or masses. Like Malcolm, rappers--for better and worse--often presume a black male audience in their work. We'd never mistake TuPac and BIG for Malcolm, but there is at least some kind of link among these brothers who moved the crowd and were tragically cut down by hails of bullets, right? And although Malcolm had far different things in mind when he spoke of black nationalism, it's hard not to recognize spirits nationalist thought throughout rap with leading figures, for instance, rallying folks to embrace "all black everything." There was little talk about poets and rappers in all the coverage of Manning Marable's biography of Malcolm. Maybe discussion on the particulars of Malcolm's influence and ongoing legacy will emerge later. In the meantime, I'll keep paying attention to his ghost haunting the pages of works by black arts poets and the music and personas of various rappers.